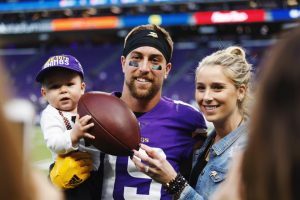 Whether on the field or in the local community, the Thielen's have been overwhelmed by the love and support they have received from the Minnesota community both growing up and during Adam's playing career. Because of this, Adam and Caitlin have felt compelled to give back to the community that has given both of them so much over the years. As a result, the Thielen Foundation was formed. With an overarching theme on youth development, the Thielen Foundation aims to create programs that serve, educate and inspire individuals so they're equipped and empowered to reach their full potential in life. 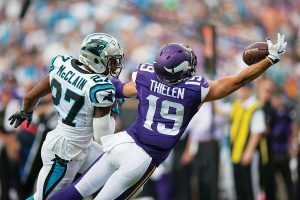 The Thielen motto to “achieve your full potential” is a guiding principle lived out by Adam every day and is meant to inspire and motivate individuals to overcome challenges and adversity so they are able to tackle some of life's biggest goals. To stay informed on the latest news and updates, please subscribe to the Thielen Foundation newsletter at the bottom of the page. 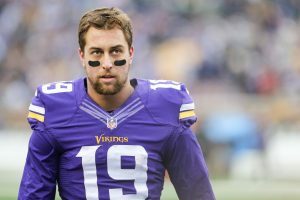 Adam Thielen is an American football wide receiver who plays in the NFL for the Minnesota Vikings. While many have coined Adam’s journey to the NFL as a Cinderella story, his path to success is the result of unswerving perseverance, determination and faith. Born and bred in Detroit Lakes, Minnesota, Adam’s story began when he first witnessed greatness in his favorite Vikings players, Cris Carter and Randy Moss. Adam’s passion for the game growing up, matched with his ceaseless motivation to reach his fullest potential, earned him a spot on the Minnesota State-Mankato football team. While Adam had a successful college career, he went undrafted in 2013. With the odds seemingly stacked against him, Adam kept his head down and trained rigorously to give NFL scouts a reason to turn their heads. His hard work paid off when the Vikings invited him to rookie camp where they signed him as an undrafted free agent. Adam worked his way to becoming the Vikings lead receiver in 2016 with a catch rate ranking him in the top five players among NFL wide receivers. 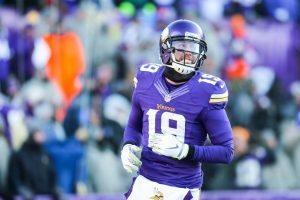 In 2017, Adam became the first Vikings wide receiver to be a 1,000-yard receiver since Sidney Rice in 2009 and was selected for the 2017 Pro Bowl and named second-team All-Pro.